Published to mark the 500th Anniversary of the Reformation. For the past five hundred years God has been pouring out His Spirit, to reform and to revive His Church. 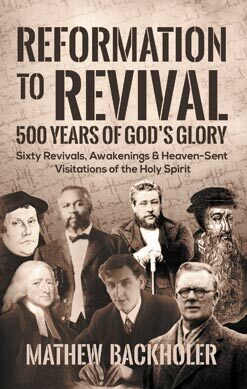 Reformation to Revival traces the Divine thread of God’s power from Martin Luther of 1517, through to the Charismatic Movement and into the twenty-first century, featuring 60 great revivals from 20 nations on five continents. Walk with George Fox during the Quaker Revival in Puritan England and into America; rejoice with Count Zinzendorf of the Moravian Revival and the great mission advance, and see America and Britain transformed under the preaching of Jonathan Edwards, John Wesley, George Whitefield and friends during the Great Awakenings. Discover the depths of the great 1859 Revivals; labour with Jonathan Goforth of China, in Korea and Manchuria and see Wales transformed under the power of the Holy Spirit because of the faith of Evan Roberts. Read about the Pentecostal explosion of the Azusa Street Revival and the great works of God across Britain and America into the twenty-first century. Sixty revivals, awakenings and Heaven-sent visitations of the Holy Spirit in the nations of: Germany, Britain, America, Switzerland, South Africa, Norway, Sweden, Scotland, England, Wales, Ireland, China, Korea, Japan, Ghana etc., Manchuria (annexed by Russia), India, Australia, Ruanda, Argentina and Indonesia. 12. The Parson is Converted! Mathew Backholer is the co-founder of ByFaith Media (www.ByFaith.org) and films and presents ByFaith TV which airs on numerous Christian networks around the world. As a revival historian he collates, documents and records revivals from around the globe. He is the author of a number of books including: Global Revival, Revival Fire, Revival Answers, Short-Term Missions and Extreme Faith.